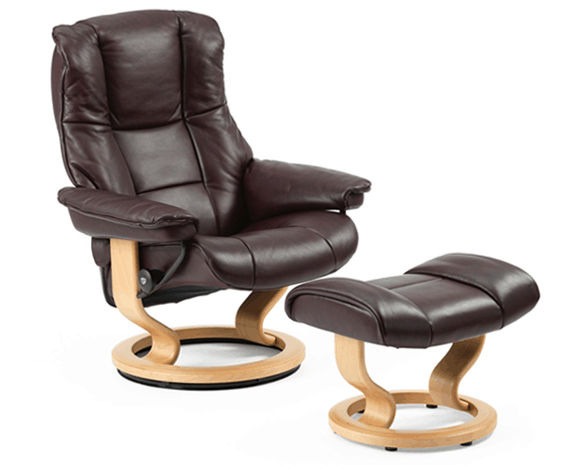 Inspired by London fashion, Ekornes Stressless recliners are the perfect combination of function and beauty. 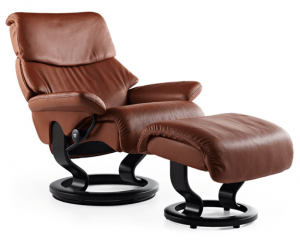 The Stressless Mayfair transforms a traditional T.V. recliner into a luxurious piece of furniture with graceful curves, cushioned arms and a flexible seat. The Plus™ system gives way as you shift to give optimal neck and lumbar support. This sleek recliner’s Glide system responds to your body’s movement for ultimate comfort. A 360 swivel provides ease for positioning yourself in the room. An adjustable ottoman completes the experience of ultimate comfort. As the largest in this series, the Mayfair’s combination of functionality and style is built to impress. Customers who purchase a Mayfair love that this design comfortably supports bodies of any size. As you move in the chair, the Plus™ system responds by adjusting support to the neck and lumbar region of the back. Combined with an adjustable head rest, you’ll always have the perfect angle for reading, sleeping, or watching television. The Stressless Glide System supports good circulation because your weight is properly balanced at all times. A full 360 swivel allows you to achieve the perfect angle in relation to the room so you never have to strain your body. The Ottoman tilts and adjusts to become just the right height and angle for you to achieve optimal comfort. The large sized Mayfair brings the grandeur of London to your living room. Its sleek design pleases the eye while the Plus™ and Glide Systems conform to your body’s needs. Both elements make the Mayfair essential to the beauty and comfort of your home.